We are incredibly proud to announce that DECENT.bet will be launching an esports platform, playDECENT.gg, allowing users to bet on themselves through tournaments and quests, as they compete in their favorite competitive video games. This P2P product launch is possible through a new strategic partnership with PlayVIG. With over 20M games played, PlayVIG is a rapidly growing, immensely popular free competitive gaming platform. What games will be available on playDECENT.gg? The specific esports supported with the initial launch of the platform will be some of the most successful and popular titles in the world: Fortnite, Hearthstone, DOTA 2, and PlayerUnknown’s Battlegrounds (PUBG). Collectively, these games enjoy over 361M monthly users. It’s not just the player base that’s huge, it’s the audience size and engagement. A Gameloco study estimated that in 2018, a total of 2.63B hours of these four titles alone were watched on Twitch in 2018. And a a recent Newzoo study estimates that the total eSports viewing audience will grow to 644M by 2022. More popular titles will be added to the platform as we ramp up growth, including games like Apex: Legends. It’s important to us that we properly service all games and customers, so we will smartly grow and add new titles as our platform and resources can effectively manage them. Competitive video games like these titles continue to be among the fasting growing sports in the world. This is an industry that from day one has been a strategic priority of ours due to its ability to attract a younger demographic into our gaming products. By creating a platform that allows users to bet on their own gameplay, we will not only drastically increase our market exposure and growth potential as an organization, but we will provide our user-base with a way to monetize their skills and passion. Importantly, the playDECENT.gg launch will be accompanied and further fostered by our partnership with PlayVIG. We will work closely with them to drive their free-to-play users directly onto the playDECENT.gg platform. playDECENT.gg will utilize PlayVIG’s proprietary game tracking technology (the “Virtual Referee”) to allow for a trusted, seamless way for contest outcomes to be reported and winning bets to be paid out. This is very important — it’s a complete market differentiator — something no one else has done before — and it fits with our ethos of transparency which, of course, is a driving force with blockchain technology and the overall space. playDECENT.gg will also be advertised on PlayVIG to its fast-expanding database of active players who spend 22,000,000 minutes in the platform each month. This will exponentially increase the awareness of playDECENT.gg and all of Decent.bet’s other products. PlayVIG users earn VIG coins by playing on PlayVIG’s free-to-play platform, and can then choose to redeem VIG coins for DBETs or other items like in-game content, gift cards, etc. So, what does all of this really mean? First, it continues our product roadmap progression. The internal testnet for this P2P esports product will launch by March 31st. We’ll then take this to a closed beta testnet at The VeChain Summit in San Francisco (more about this, including the public application process, by end of next week). Furthermore, this partnership allows us to launch a platform where anyone with DBETs can wager on their favorite esports game, and through their skill at that game, win DBETs from their opponent. Esports and cryptocurrency have a significant market overlap. Both are dominated by millennials who are tech-savvy. It’s no coincidence that the country that has the largest cryptocurrency adoption is also a giant in esports adoption, South Korea. This new partnership will also allow for an easy on-ramp for anyone to earn DBETs by playing the games they love on PlayVIG. Individuals can then compete on our platform and be rewarded for their skill in tournaments. We will also create an online store in the platform to allow users to purchase gift cards for their favorite game platforms with DBETs. This will allow users an easy way to turn their winnings into their favorite game content. Additionally, with our listing as an item to redeem in the PlayVIG store, we will also be marketing to the PlayVIG user-base. With the launch of playDECENT.gg, we will be able to access new markets. Due to the classification of esports as a game of skill as opposed to one of chance, it opens the door to more jurisdictions that would have previously been closed off for our more traditional casino gaming products. These jurisdictions include major markets in Asia, Europe, as well as the US. However, in all cases, any individual wishing to compete and wager should confirm their eligibility and local laws before participating. Currently, we are working closely with the PlayVIG team (as we have been for two months) to determine the path of least resistance to our testnet and eventual product launch. This path includes everything from software integration to determining the best client for the initial launch. As we get closer to testnet, we will release further details, including relevant launch dates and the order of client release. Clients supported will include web and mobile, Windows and Mac. Additionally, we will be publishing a revised whitepaper (2.5) and roadmap reflecting both the esports P2P product scope and market size. We needed to create, implement and monitor the essential mechanisms for future growth. We’ve now done that, both with our new and improved VeChain-based wallet as well as our successful slots mainnet deployment. This is another step in a focused product build. All of us know that the blockchain market is young and developing. We are committed to building products that work on-chain that customers will enjoy. Overall, blockchain technology has a far lower threshold for error than traditional software development. It’s important that we get it right, not only the end-user’s safety, but for overall business viability. From day one we’ve wanted to create and work on something truly exciting that has the potential to positively impact a large audience of people from around the globe. Now our funnel of potential users and overall growth is far, far greater than it ever has been before. The future is bright, and we can’t wait to continue to share it with all of you. 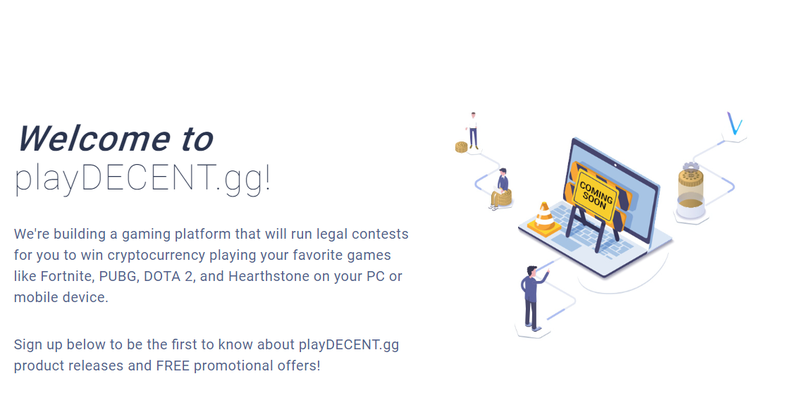 To sign up for more information, as well as special promotions around the playDECENT.gg product launch, visit: https://playdecent.gg/. Finally, DECENT.bet founder and CEO Jedidiah Taylor has some words on the partnership and its importance in the below video. We’ll see all of you in our social channels and will be available to answer any questions you may have as promptly as we can.